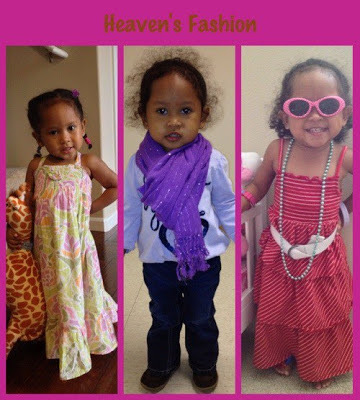 One of the things I enjoyed as a Mom is seeing our little ones trying out their best to dress up their selves. When we're at home, both our girls will be playing in their toy room, watch tv, coloring or reading, and playing dress-up. Little girls love to play dress-up. This is why I separated their dress-up clothes and hanged it in their toy room's closet so they won't be rummaging their closets. This picture below is an example of how our little one just love to dress up at home. She's playing with her big sissy and often they'll tell me they're having a fashion show. I just let them be. Playing pretend is a good way to develop their imagination. They can surely come up with different styles and I just can't stop but laugh and get amused by them. awww! She is sooooooooooooooooooooooooooooostinking cute Momi Bless :-) Please give give a tight hug for me and kiss too.